WASHINGTON (May 27, 2010) -- The Army recognized a milestone of 1 million hours of flight for unmanned aerial systems, May 25 at the Pentagon. Several UAS vehicles were on display in the courtyard of the Pentagon to officially mark the event. Those vehicles included the MQ-1C Extended Range Multi-Purpose UAS, the RQ-7B Shadow, and the RQ-11B Raven. Chief Warrant Officer Anne M. Thrush said unmanned aircraft systems employment in the Army has gone from a time when commanders didn't understand or know what to do with information provided by the systems, to a time when commanders do not want to go to war without them. The Army recently passed 1 million hours of flight time on its unmanned aircraft. According to the Army Unmanned Aircraft Systems Project Office, Army UAS actually surpassed one million flight hours April 14. Of those hours, 88 percent were flown in Iraq and Afghanistan. According to the project office, the RQ-7B Shadow flew nearly half of those hours, with 478,350 hours to its credit. Col. Gregory B. Gonzalez, the project manager for unmanned aircraft systems, said that since the Army began really experimenting with UAS, a lot has changed. "Acceptance of unmanned aircraft systems was not immediate," he said. "Upon their introduction into the Army inventory, unmanned aircraft were met with some levels of skepticism and doubt. But after initial inefficiencies were overcome and improvements were made, these doubts turned to acceptance." Today, he said, there is increased demand for those UAS, and the Army flies more than 220,000 unmanned aircraft hours each year. "Each hour represents not just time, but time well spent," Gonzalez said. "Perhaps, most importantly, UAS flight hours (are) time well spent keeping Soldiers safe, finding and killing our enemies and collecting information that will lead to future successes." Those hours also represent lessons learned, and changes in how UAS are used in the Army. 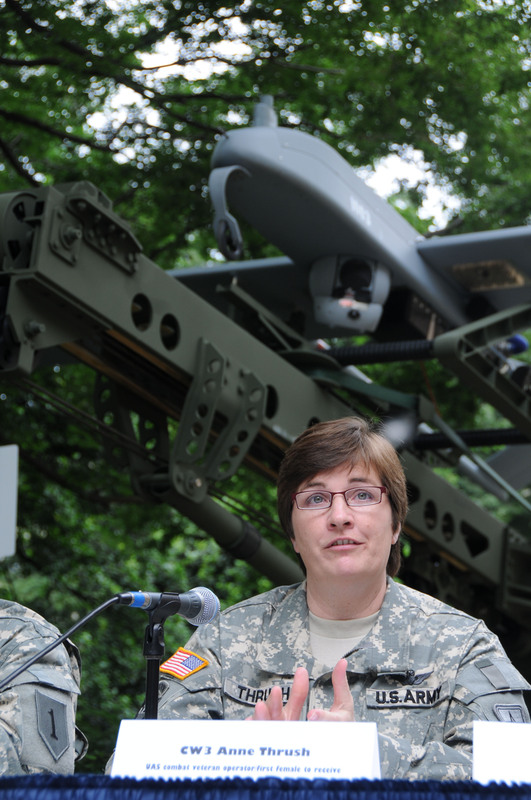 Chief Warrant Officer Anne M. Thrush said UAS employment in the Army has gone from an obscure military unit operating an unmanned system where operating units didn't "understand how to use the information or process the information that was being provided to them," to a battlefield today, where "commanders incorporate UAS from beginning to end in their operations, often not wanting to conduct critical missions without their UAS support." Thrush worked early in her military career with the RQ-2 Pioneer UAS, and later on with the RQ-5 Hunter system. She also served as an instructor and standardization operator and also spent six years at the UAS schoolhouse. Gonzalez said the Army has learned that the best way to exploit the capabilities of technology like unmanned aircraft is to give it to Soldiers. 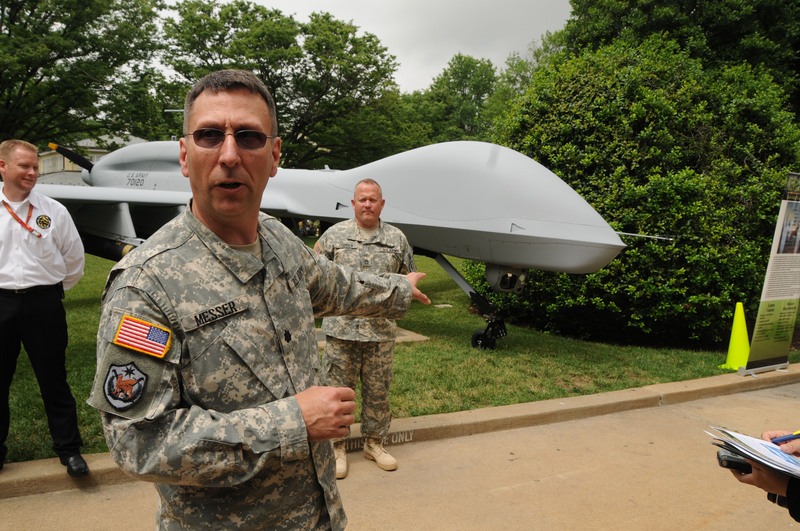 Lt. Col. Kevin Messer, product manager for medium altitude endurance systems in the Army Unmanned Aircraft Systems Project Office, spoke May 25 about the capabilities of the MQ-1C Extended Range Multi-Purpose UAS on display in the courtyard of the Pentagon. The Army recently passed 1 million hours of flight time on its unmanned aircraft. "The key has always been to get the equipment into the hands of Soldiers," he said. "As the systems are utilized more and more, the ideas just blossom from there." Staff Sgt. Charles Cannon, a Shadow UAS operator out of the 1st Brigade, 1st Infantry Division, at Fort Riley, Kan., said flying the UAS provides him real-time feedback on how his contribution to the fight can change the mission. "I think it's great we get to see how we are affecting the mission," Cannon said. "We can see we have saved this guy's life, because we provided the information he needed to act prior to being attacked." Cannon also said he sees how commanders react to the information he can provide with the UAV he flies. "We watch how the battlefield changes based on what we are finding and what we are providing," Cannon said. Tim Owings, the deputy project manager for unmanned aircraft systems, said he believes the future of Army UAS is secure. "Because they have been so well integrated into the Army, I cannot imagine the Army going to fight without these systems ever again," Owings said. The future of Army unmanned aviation includes developments such as high-definition cameras and signals intelligence packages. "There's really no shortage of ideas ... of what we can do with the Sky Warrior system or any of the other systems, in terms of where we are going to go with them," Owings said.